At Christ the King, we strive to have the most dynamic, spiritual and actively involved ministry team in Kern County! Its more than just showing up and being there; we want to be in it with our teens for all the good moments in life, and the bad ones too. 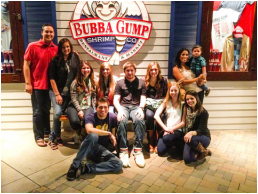 Last year, our ministry team was made up of more than 25 adults to serve the teens at our parish. That's a whole lot of passion all at one place! From young adults just entering college, to parents wanting to give back to their parish; we all came together through our love for Christ to serve Him and His Church! Interested in joining our team? Click below to explore our Core Guide and contact Directors below if you're ready to join our team! Life Teen, Edge and Confirmation Programs. Interested in being part of something pretty amazing? Fill out the information below and we will be in contact with you! I'M INTERESTED IN JOINING CORE! Led by a group of parents who serve because they know and believe in what youth ministry can do in the life of young people. Find out what you can do to help in leading teens closer to Christ at CTK! Contact Directors of Youth Ministry or Clare Barksdale if you're ready to get more involved this year! I'M A PARENT WHO'S READY TO GET INVOLVED!